After the indictment on Friday Mr. Trump declared in a Twitter post that “the results of the election were not impacted. The Trump campaign did nothing wrong — no collusion!” He made no mention of Russia as a “revisionist power,” the description used in his own National Security Strategy, or of the elaborate $1.2 million-a-month effort that the indictment indicated Russia’s Internet Research Agency spent in an effort to discredit the election system and ultimately to support his candidacy. Vice President Mike Pence, speaking this past week in Washington, misstated American intelligence conclusions about the election hacking, arguing “it is the universal conclusion of our intelligence communities that none of those efforts had any effect on the outcome of the 2016 election.” The intelligence chiefs have said they have not, and cannot, reach such a conclusion. Sergey V. Lavrov, the Russian foreign minister, cited Mr. Pence’s comments during the session here Saturday to make the case that Russia did nothing wrong. “So until we see the facts, everything else is just blabber,” he said. The man who served as the Russian ambassador to the United States during the period covered by the indictments, Sergey I. Kislyak, picked up on a favorite theme of Mr. Trump’s: questioning the credibility of the F.B.I. and intelligence agency assessments. The accusations and counteraccusations about cyber- and social media attacks were the main point of division between the Americans and the Russians, but hardly the only ones expressed at the conference. Mr. Kislyak argued that the Trump administration’s new nuclear strategy involved the manufacture of low-yield weapons and made nuclear war more probable. The Americans argued they were just matching Russian capabilities and charged that Moscow was in continued violation of the Intermediate Nuclear Forces agreement, limiting tactical weapons. Yet the cyberattacks on the Democratic National Committee and others, and the use of Facebook, Twitter and other social media platforms to spread propaganda, dominated the discussion and reflected how quickly the use of these techniques has become the new battleground in a very different kind of post-Cold War conflict. General McMaster, in his comments, argued that Russia had bridged the partisan divides in the United States, citing a 98 to 2 vote in the Senate to impose Russian sanctions. He did not mention that the administration has yet to impose those sanctions, saying the threat of them alone has begun to change Russian behavior. 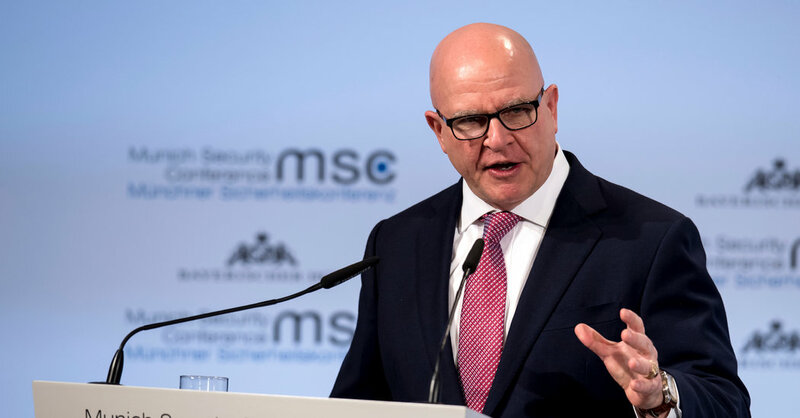 General McMaster was questioned by the chairman of the foreign affairs committee of Russian Federation Council, the country’s equivalent of the Senate, about whether the United States was ready to enter into some kind of negotiation with Russia about the use of cyberweapons. It was not the time for that yet, General McMaster said, adding, “I’m surprised there are any Russian cyberexperts available based on how active they have been in undermining the democracies” of the world.